Being an islander, it is hard to impress me. I like islands in Thailand because they are rustic. However, there isn’t much to see here because Langkawi is basically booze and chocolates. Perhentian and Redang getting too expensive to pay for the kampung feel. Tioman is too far away for Penangites. So, there is only Pangkor left for me. However, it doesn’t impress me much. So much so that we have not been to Pangkor for over a decade. Sadly, the rustic feel is lost. There are no tiny lanes and attap houses to give the fishing village scene. This is what is left of it. Now, the island has been developed with tacky structures including several storey high 1Malaysia structure. 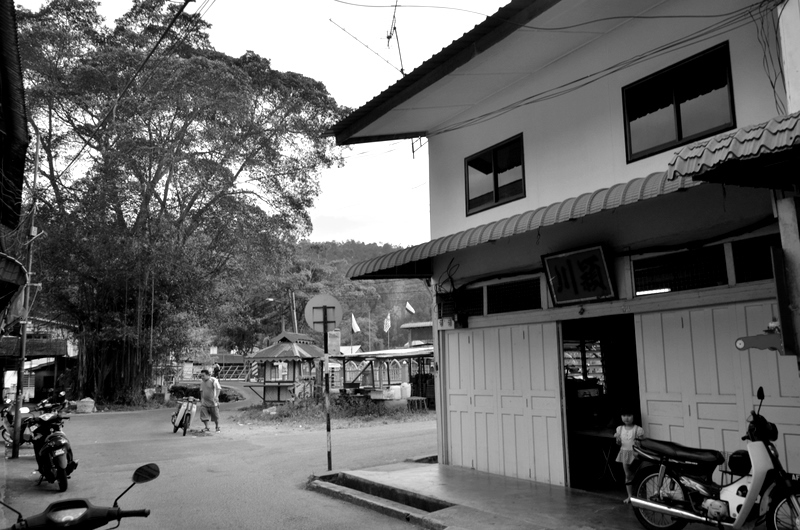 I love this sort of houses, not brick, cold, uninspiring budget hotels and shophouses that filled the roads. 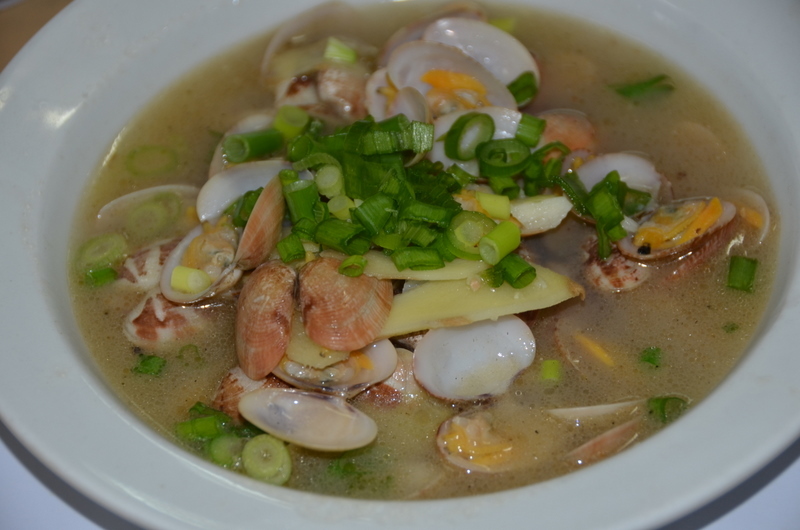 I googled for seafood in Pangkor and was delighted to find this place which was mentioned by the Lonely Planet. 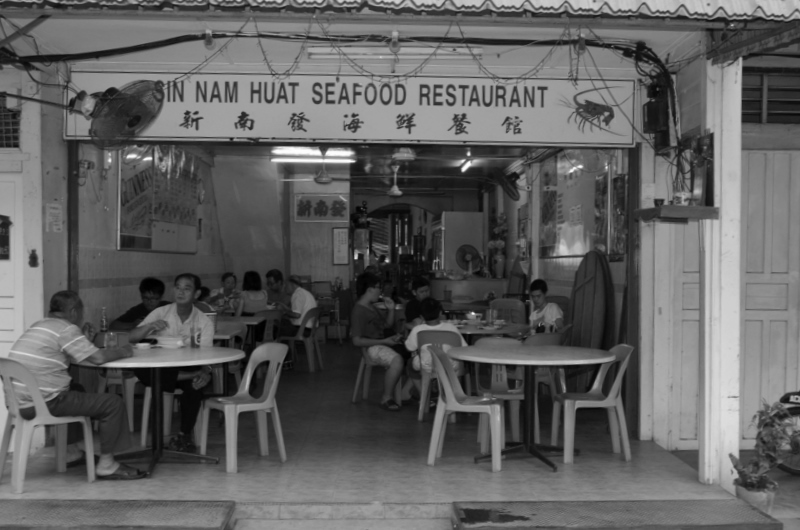 Sin Nam Huat Seafood Restaurant is located at 51 Jln Besar Pangkor Town. 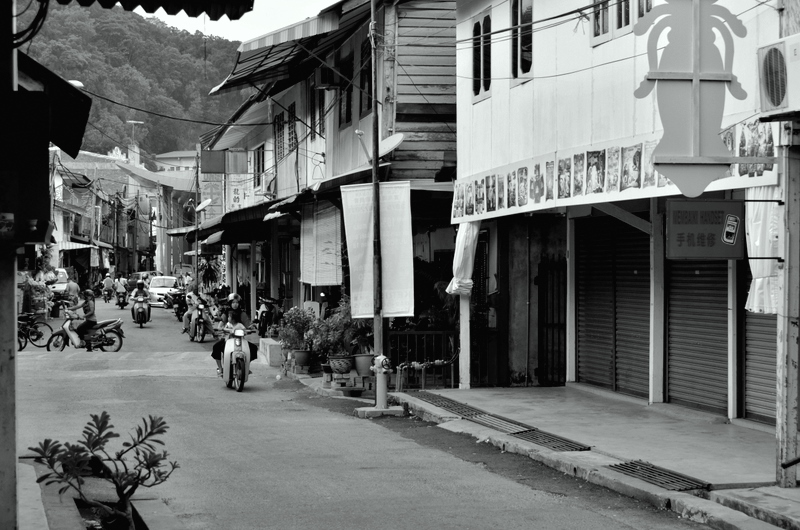 Anyway, it is not difficult to locate any shop in Pangkor because it is basically a tiny island. Foursquare tips said the fried noodle is good. So, we ordered a plate and I must say it is not bad as there is no yellow noodle smell of ammonia. It doesn’t reek of lard too. The other dish we ordered is the ching tong lala or clear soup lala. The lalas are awfully tiny so it is quite a chore to pick the flesh from the shells. So, kinda disappointing. My children loves mantis prawns so we have this dish. I ordered butter prawns for the adults but unfortunately, the boss mistook our order and I ended up with no prawns. 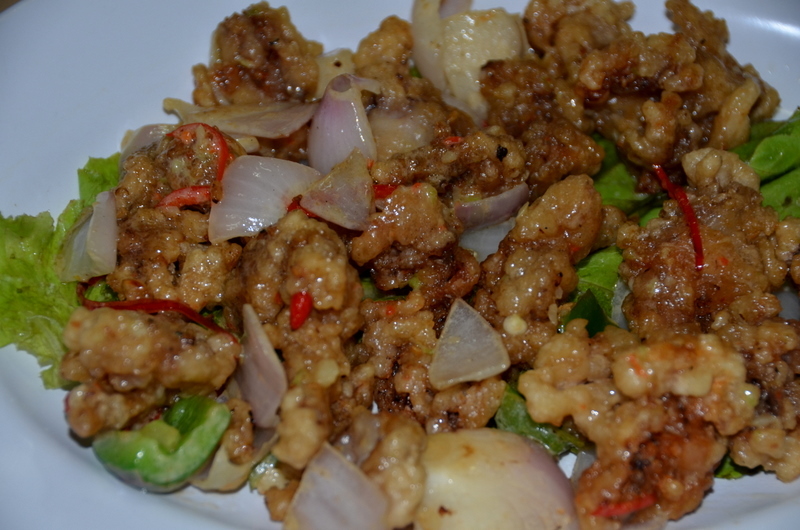 The orh chien was recommended to us but being a Penangite, I am not used to eating it this way. I like my Penang orh chien better. I feel there is too much egg and not enough sticky chewy tapioca flour part. However, the oysters are fresh. The other dish we ordered was the koo-lou yoke. This place serves pork, btw. 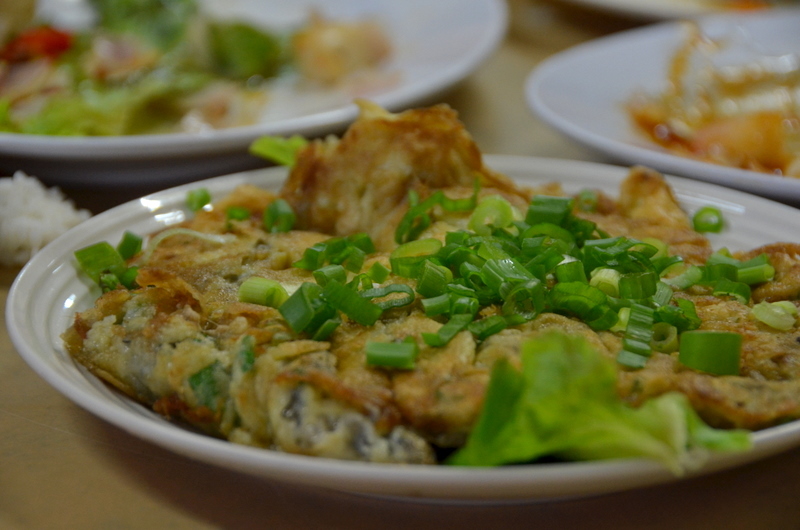 We also asked for deep fried fishes (suah chooi) but they don’t have them either. After the above meal, I didn’t feel full. 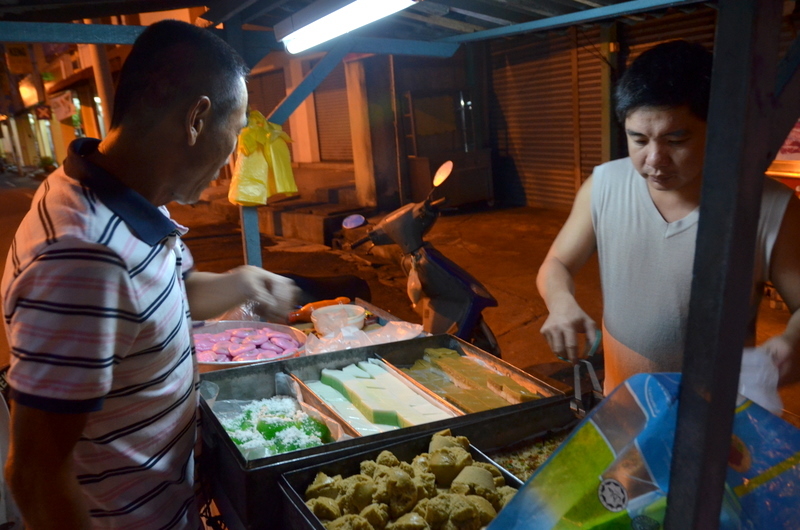 So, this kueh seller by the roadside caught our eyes and we made a reverse and got down to buy some kuehs. The pink colour teochew chai kuey which is filled with chives is nice. I love it! 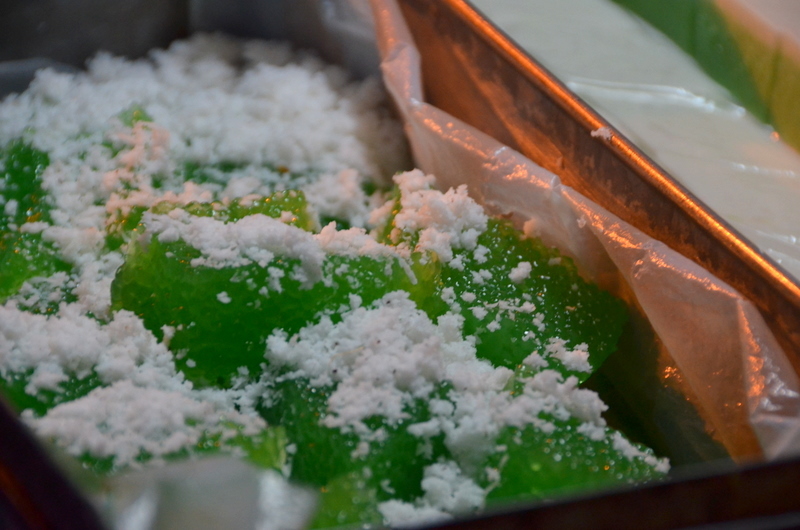 However, this green abok-abok sago is nothing like our Penang one. We also bought some kueh talam but that turned out rather bland.